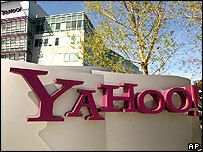 Strong growth in online advertising has helped internet media company Yahoo double its quarterly profits. The web giant made a net first quarter profit of $205m (£107m), compared with $101m for the same period last year. Excluding the fees that Yahoo pays to its advertising partners, revenues grew to $821m, up from $550m a year earlier. Both the profit and revenue figures were ahead of Wall Street expectations, and Yahoo shares rose by 4.8% in after-hours trading on Tuesday. "Yahoo entered 2005 on a high note, delivering strong growth and record revenue for the eighth consecutive quarter, further validating the strength of Yahoo's business model," said Yahoo chairman Terry Semel. "We are on the cusp of witnessing a significant increase in engagement of consumers on the internet and believe we are best positioned to capitalize on the many opportunities to which we are exposed."